I have a Raspberry Pi at work that I use for listening to STAPLR. A while ago it fell off the university’s wifi network. 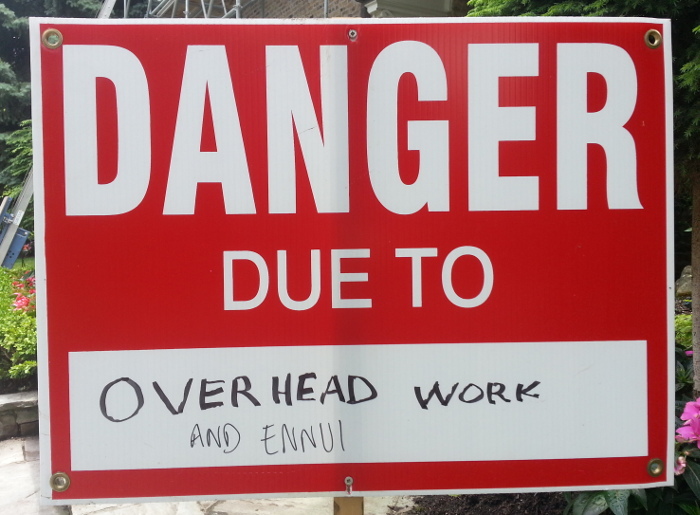 Today I got around to fixing that. For some unknown reason I had to do more today than I did back when I first got it on the wifi, but such is the way of computers. For my own sake I’m documenting what I did here, and maybe it will be useful to others. This is based on: Raspberry Pi 3 and PEAP-MSCHAPv2 WiFi Networks by Nontas Rontogiannis and an answer in a Raspberry Pi forum by broo0oose. Thank you, fellow Pi users who are on not on a simple wifi network! You can enter your password in plain text, but that’s a terrible thing to do. Instead, use a hashed version. Then take the text in hash.txt and add it after “hash:” in the password field. After rebooting it all worked, even though the network icon in the icon bar showed no connection. This puts the hashed password into the X clipboard, where it’s easier to paste. You’ll still want to wipe it from your history. Why the Pi doesn’t support this kind of network out of the box, I don’t know, but I hope they add it. Nevertheless, the Pi is marvellous little thing. I’m a librarian at York University Libraries in Toronto. Let’s call me Librarian Bill when I’m there. At home I’m Civilian Bill, and last month Civilian Bill put in a freedom of information request to York University for the amounts the Libraries spent on electronic resources in fiscal years 2017 and 2018. Civilian Bill knew the information exists because Librarian Bill prepared a spreadsheet with precisely those costs. Civilian Bill appealed. Seven months later Civilian Bill and Librarian Bill am very happy to report the data will be released. My appeal was handled the by same mediator who had my request for communications between the chairs of York’s Senate and Board of Governors, which made me happy. She was excellent: helpful, informative, quick to act, expert on all aspects of the legislation and a fine example of the civil service at its best. If you’re in Ontario and have an idea for a freedom of information request but are worried things are stacked against you, don’t be. My mediator—I assume they’re all equally good—was everything I’d hoped for. Last fall I had a number of phone conversations with the mediator, and she in turn talked to York quite a bit. The mediator said (I paraphrase—any misunderstandings are mine) that the Freedom of Information and Protection of Privacy Act (FIPPA) didn’t recognize non-disclosure agreements, so that part of its argument didn’t hold up. The adjudicator might look favourably on my request … but it would take two or three years to get to adjudication because there’s a big backlog. It emerged that the problem, from York’s point of view, was that the information about NDAs in the big list of eresources I’d help create was unverified. My impression was that York thought it needed to be reviewed and double-checked. At least that was a potentially justifiable reason, unlike the unexplained blanket “denied in full” that was the initial response. We were at an impasse. Mediation was unsuccessful. York wasn’t going to release the data. I informed the mediator I wanted to go to adjudication. 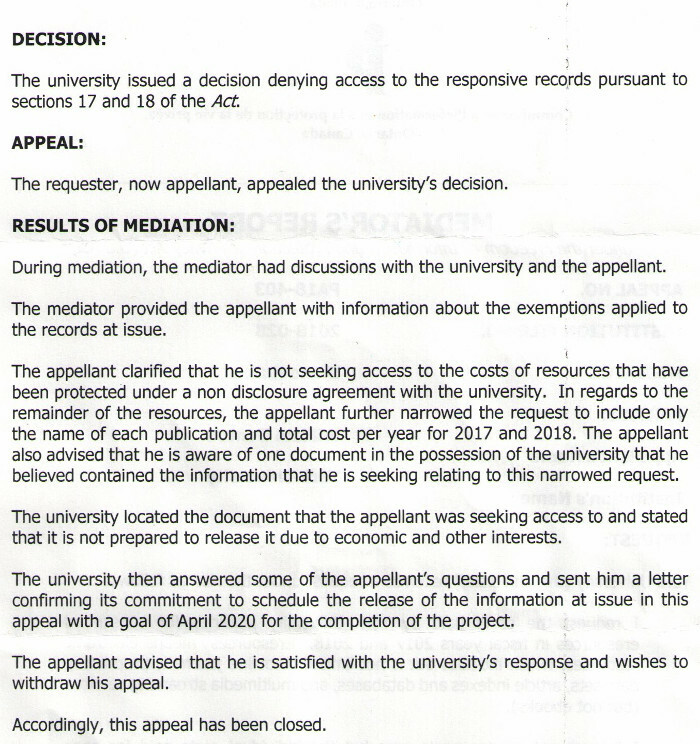 As a result of mediation with [the mediator] at the Information and Privacy Commission York University would like to suggest as a possible resolution to Appeal PA-18-403 a schedule for the release of the costs you have requested. York University would be able to commit the resources necessary to schedule the release of this information by, or in advance of, April 30, 2020. As a result of mediation with [the mediator] at the Information and Privacy Commission York University would like to suggest a possible resolution to Appeal PA-18-403. York University is committing the resources necessary to schedule the release of this information with a goal of April 30, 2020 for the completion of this project. It is hoped that this will resolve the appeal. The university issued a decision denying access to the responsive records pursuant to sections 17 and 18 of the Act. During mediation, the mediator had discussions with the appellant and the university. The mediator provided the appellant with information about the exemptions applied to the records at issue. The appellant clarified that he is not seeking access to the costs of resources that have been protected under a non disclosure agreement with the university. In regards to the remainder of the resources, the appellant further narrowed the request to include only the name of each publication and total cost per year for 2017 and 2018. The appellant also advised that he is aware of one document in the possession of the university that he believed contained the information that he is seeking relating to this narrowed request. The university located the document that the appellant was seeking access to and stated that it is not prepared to release it due to economic and other interests. The university then answered some of the appellant’s questions and sent him a letter confirming its commitment to schedule the release of the information at issue in this appeal with a goal of April 2020 for the completion of the project. The appellant advised that he is satisfied with the university’s response and wishes to withdraw his appeal. Accordingly, this appeal has been closed. What made York change its mind? I don’t know. There were two bodies involved: the Information and Privacy Officer and the Libraries. I assume the two were able to work together to arrive at this result. I have no idea. No one in the Libraries has told me anything about my appeal—not brought it up in conversation, not so much as alluded to it. Now, this data is going to be released to me personally. Whatever I get, I’ll make it public, but of course my goal is for York to release this information itself, in a good data set, like other universities do. If York can give me the information, it seems to me there’s nothing preventing it from doing a proper full release. And I hope that with F2017 and F2018 done there will be nothing to prevent York from releasing F2019 and onwards, because each year we only add a few handfuls of new eresources and their license agreements will be easy to check. This all began “early in 2017 [when] Librarian Bill was part of a group at York University Libraries that resolved to make public the costs YUL spent on electronic resources.” That didn’t happen, so in 2018 Civilian Bill filed a FIPPA request, was denied, and appealed. In 2019 a satisfactory plan was proposed for releasing the data; as a result the appeal was dropped. Civilian Bill should have the data in early 2020. When he does, both Civilian Bill and Librarian Bill will be happy. The parties agree to continue their practice of upholding, protecting, and promoting academic freedom as essential to the pursuit of truth and the fulfilment of the University’s objectives. Academic freedom includes the freedom of an employee to examine, question, teach, and learn; to disseminate his/her opinion(s) on any questions related to his/her teaching, professional activities, and research both inside and outside the classroom; to pursue without interference or reprisal, and consistent with the time constraints imposed by his/her other University duties, his/her research, creative or professional activities, and to freely publish and make public the results thereof; to criticize the University or society at large; and to be free from institutional censorship. Academic freedom does not require neutrality on the part of the individual, nor does it preclude commitment on the part of the individual. Rather, academic freedom makes such commitment possible. I’m privileged to have academic freedom and I’m happy to use it. I’m running “Phasers on Satie (Long Phase)” on STAPLR for a while. It uses the left-hand riff from Vexations by Erik Satie, normalized so all the notes are the same length. There are eighteen notes, and it’s running at 54 beats per minute, so it plays three times a minute. Every time there’s an interaction at one of the York University Libraries desks, the piece begins to play for as many minutes as the interaction was long, but after the first time the riff is played it starts to go out of phase, and gets a little more behind every repetition. The phase length is such that the first note is just about to run into the second note by the time the repetitions are done, but it stops one repetition before that happens. 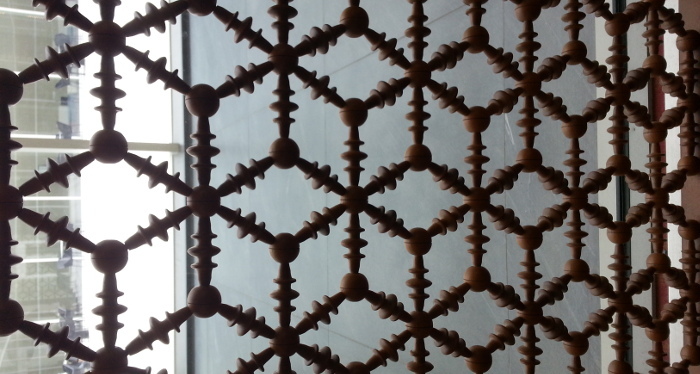 Because the interactions at the desks start at different times and last for different durations, many different types of patterns can crop up. The title is a tribute to the Canadian prog band FM and the late, great Nash the Slash. FM did “Phasors on Stun” on their first album, Black Noise. Yesterday I picked up two vintage fountain pens I’d given for repair to Toronto nibmeister Jeffry Fridfinnson. They look great! If you’re in the Toronto area and looking to get a fountain pen restored, get in touch with him. He does it as a sideline and has a queue, so the work will take a little while, but if your pen is unusable, you’re not missing anything in the meantime. One of the pens is a black Esterbrook transitional J lever-filler that is more than 70 years old. I bought it at the Scriptus pen show over three years ago. I was looking to try some vintage fountain pens and Esterbrooks were recommended as a good type to start with. There were many of them made, they’re easy to find now at low prices, and even nib units are easy to find and pop in. I bought mine for about $40 as is, I think. It never really worked. There was something wrong with the nib and it was always dry. I swapped in another nib but that didn’t work either. I left it in my drawer for a couple of years, then realized I should either try to sell it or get it fixed. 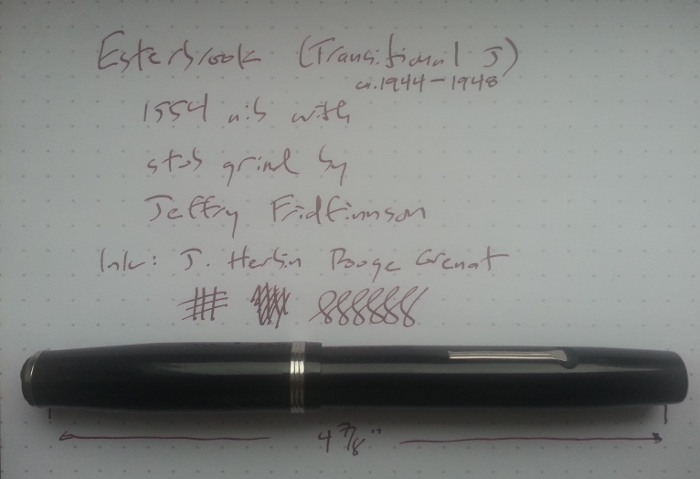 I took it to last October’s pen show, saw Jeffry Fridfinnson at a table, and showed it to him. He immediately saw what was wrong and said he could fix it, replace the ink sac ($25), and do a stub grind ($50) as well. I’d decided it was time to try getting a nib ground—what’s the point in having different pens that all end up writing the same on paper? I realize everything aside from the pen looks grey, but that’s what you get taking a photo using natural light on a cloudy March Toronto day. The line variation isn’t huge, but the nib was on the small side to begin with, so the grind didn’t have a big effect. Still, I like it. This pen is smaller than what I usually use, but it’s very comfortable and it writes perfectly now. I’m very glad it’s restored. The other pen is an Eclipse Hooded Knight, which was made in Canada. I’ll post about it when I’ve had a chance to use it for a little while. 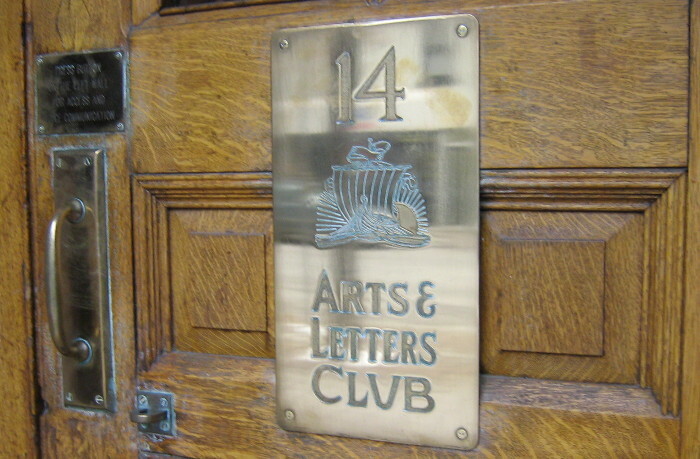 I’m a member of the Arts and Letters Club of Toronto, which is a wonderful place with a great bunch of people who get up to all sorts of interesting things. It was founded in 1908—the Wikipedia entry set out the basic history—and it’s changed over the years but there are still lots of artists, writers, musicians, people who work in theatre on stage or off, photographers, librarians and others from all parts of the book world, architects, archivists, and more. Friday nights are Ad Lib, when the third floor studio is given over to a loose and informal event where people can just show up, take part or not, and enjoy. Different people organize them; some events are one-offs and some repeat every now and then. Damon Lum oversees everything. Last night Ashley Williamson and I ran “Readings and More,” where we selected short readings from poetry, plays and essays and gave them to people an hour before things started: enough time to read them over and maybe think about what voice they’d use, but not enough for anyone to think they couldn’t make mistakes or that everyone else would expect them to be perfect. It was immensely enjoyable. The last big event was “Simultaneous Shakespearean Sonnets.” Shakespeare’s sonnets are some of the finest poetry humanity has ever produced, so naturally I’ve wondered, what does it sound like when many of them are recited all at the same time? I’d tried this before, and it went well, but someone pointed out after that it needed a conductor to help make everyone start the lines together. Last night we did it again, and I conducted. Two dozen people saying five sonnets simultaneously. My very grateful thanks to everyone who participated!